Why a Zoo Scavenger Hunt? The place is huge and already exciting. It can be educational and fun. It ads value to your visit and the kids also learn something new. You will create some amazing photos. As far as making it educational, zoo scavenger hunt riddle clues can be used to “classifying” animals; making the players put the ‘clue’ photo into a category like ‘mammals’, or have the players categorize clues into countries of origin. Alternatively, a zoo field trip scavenger hunt could involve find similar animals and explaining why they think it is similar. Whether with a school, or as a family; all are sure to have a great time! Our zoo scavenger hunts are available in zoo photo scavenger hunts and zoo riddle scavenger hunts. If you are looking for a way to enjoy the zoo even more, you should consider having your family and friends participate in a zoo scavenger hunt. The hunts are easy to setup and with our downloadable photo challenge list and riddle clue lists available in PDF format, the process couldn’t be easier. Because the lists are available as PDF files, they can be downloaded and printed just about anywhere. You could even make the zoo hunt more of an educational experience for children on a school trip or your children and their friends. Take our photo challenge list and have the children identify the animals and put them into categories. If you go with a photo challenge hunt, you will be able to create some very cool photos as well. There are many ways that you can customize the zoo scavenger hunt as well. Besides having children put the animals they find into categories like “mammals”, you could also have them put into categories by the country of origin, or even just the color of the animal. You could also have the children match the animals by similarities asking them why they think the two animals are similar. Our zoo scavenger hunt lists are designed to keep the visit to the zoo fun and positive for children and adults. 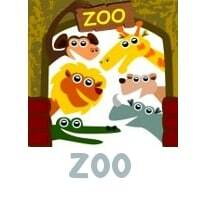 If you or someone in your group has never been in the zoo, this can be used as a great learning tool. Many children and young adults express an interest in photography and this would be a great way to customize a photo challenge for them as they walk through the zoo. Polar Bear, Lion, Giraffes, Koala, Gorilla, Rhino, Wallaby, Tiger, Cygnet, Cheetah, Dart Frog, Meerkat, Fossa Cat, Lorikeet. Orangutan, Parrots, Bats, Armadillo, Anaconda, Chimpanzees, Hyena, Chameleon, Zebra, Naked Mole Rat, Prairie Dog, Komodo Dragon, Antelope, Red Panda. These types of scavenger hunts work at any zoo, as long as the animals on the list are available. As you can see, the photo challenge scavenger hunt and the riddle scavenger hunt clues can make any occasion a little more fun. These are specific to setting up and running a scavenger hunt at the zoo. Amazing Photo scavenger hunt clues for children and adults are on our home page.